This mesmerising collection from World Fantasy Award-winner James P. Blaylock offers seven brilliant excursions into one of the most idiosyncratic imaginations of our time. Highlighted by the acclaimed novella, "The Trismegistus Club" - a brilliant riff on the antiquarian ghost story - In for a Penny goes from strength to strength, taking us deep into the heart of a quirky, deeply engaging fictional world that no one but Blaylock could have created. Other high points include "Home Before Dark," which chronicles one man's first few hours in the afterlife. Its thematic companion, "Small Houses," recounts an aging widower's last few hours on earth. Both stories constitute deeply felt, lovingly detailed farewells to the things and places of this world. In "The other Side," a minor precognitive episode leads the hero to an obsessive fascination with the hidden mysteries of the universe. In "His Own Back Yard," a story worthy of the great Jack Finney, a middle-aged man finds himself stranded in the haunted territory of his childhood. The blackly funny "War of the Worlds" uses a bowling ball and the imminent end of Life As We Know It to illuminate the fault lines in a modern marriage. 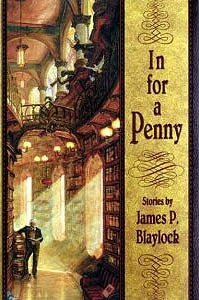 Finally, in the wonderfully imagined title story, the single-minded pursuit of treasure - of something for nothing - leads Blaylock's protagonist to a harrowing confrontation with his own worst self. Startling, funny, eccentric, and often unexpectedly moving, the Blaylockian worldview shines forth with undiminished vigor in this marvellous collection, which shows us ourselves - and the world around us - from a wholly unique perspective. At SF Site there is a review by John Berlyne of In for a Penny.